WASHINGTON (Reuters) - New U.S. single-family home sales rose less than expected in January, likely held back by heavy rains and flooding in California, but continued to point to a strengthening housing market despite higher prices and mortgage rates. Other data on Friday showed a dip in consumer sentiment this month, though it remained at a level consistent with a healthy pace of consumer spending. The economy has gained momentum, supported by a labor market that is near full employment. "It is clear that the economy is moving forward solidly. Consumers are confident and are buying homes, but builders are not getting their share of that demand," said Joel Naroff, chief economist at Naroff Economic Advisors in Holland, Pennsylvania. 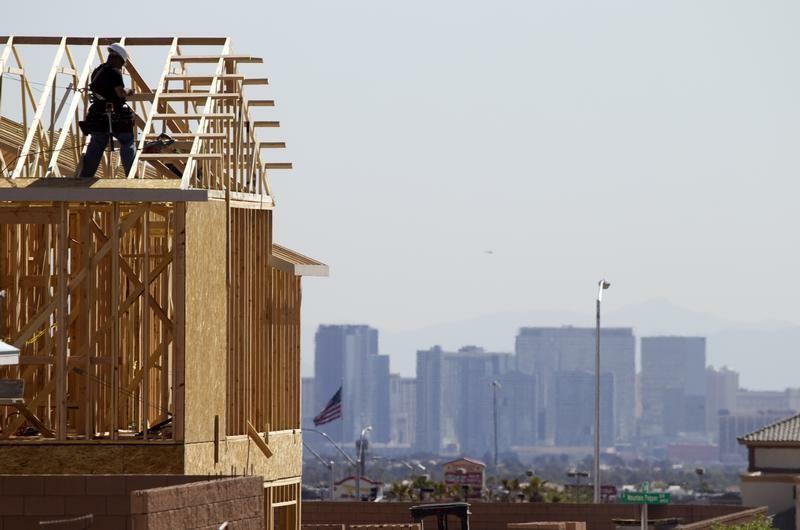 The Commerce Department said new home sales increased 3.7 percent to a seasonally adjusted annual rate of 555,000 units last month. Economists had forecast single-family home sales, which account for about 9 percent of overall home sales, surging 6.3 percent to a 570,000-unit rate. New home sales, which are derived from building permits, are volatile on a month-to-month basis and subject to large revisions. Sales were up 5.5 percent compared to January 2016. Last month, homes sales soared 15.8 percent in the Northeast to their highest level since January 2008. They rose 14.8 percent in the Midwest and advanced 4.3 percent in the South. Sales in the West, which has been hit by extremely rainy weather, fell 4.4 percent. "The unusually wet winter may have held back sales in January, but sales are still trending higher on a three-month moving average basis," said Mark Vitner, a senior economist at Wells Fargo Securities in Charlotte, North Carolina. Data this week showed sales of previously owned homes jumped 3.3 percent to a 10-year high in January. House prices increased 6.2 percent in December from a year ago. In a separate report on Friday, the University of Michigan said its consumer sentiment index fell to a reading of 96.3 this month from 98.5 in January. The index had surged in the prior three months after Donald Trump's presidential election victory. "With the focus shifting from campaign promises and philosophical goals, consumers may be acknowledging the difficult task ahead for the Trump administration to actually advance his agenda," said Jim Baird, chief investment officer at Plante Moran Financial Advisors in Kalamazoo, Michigan. The University of Michigan said February's consumer sentiment reading suggested a 2.7 percent annualized growth pace in consumer spending this year. U.S. stocks were trading lower on Friday, with the Dow Jones Industrial Average (.DJI) on track to snap a 10-day record-setting winning streak. The PHLX housing index (.HGX) fell marginally. U.S. government bond prices rose, while the dollar (.DXY) dipped against a basket of currencies. The housing market has firmed even as the 30-year fixed mortgage rate rose above 4.0 percent, outpacing annual wage growth that has been stuck below 3 percent. The tightening job market is driving the gains in housing. While the healthy labor market has not unleashed a stronger pace of wage growth, it has improved employment opportunities for young Americans, encouraging them to form their own households. But a shortage of properties available for sale remains an obstacle to a robust housing market. "Mortgage rates aren't to blame. A big part of the problem is the supply-side challenges builders are facing, like regulatory burdens, labor shortages and a lack of capital and financing options," said Jonathan Smoke, an economist at realtor.com in Atlanta. The inventory of new homes on the market increased 3.5 percent to 265,000 units last month, the highest level since July 2009. New housing stock remains less than half of what it was at its peak during the housing boom in 2006. At January's sales pace it would take 5.7 months to clear the supply of houses on the market, which was unchanged from December. A six-month supply is viewed as a healthy balance between supply and demand. The median price for a new home increased 7.5 percent to $312,900 in January from a year ago.